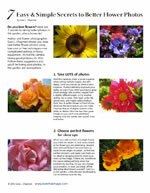 Perfect gift for flower lovers or gardeners. Both bindings have identical pages inside. 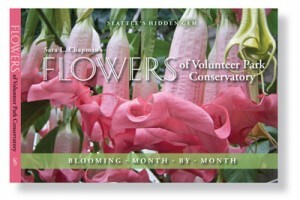 Part of proceeds donated to Friends of the Conservatory. Hardcover $27.95, Paperback $19.95, add $3 for author autographed. Washington State residents will be charged sales tax. Gift: If you’d like to order a gift and have it sent directly to the lucky recipient, saving time and postage, just put their name and address in the Paypal comments field. Be sure to double-check the address, because that’s exactly how we’ll send it, wrapped in tissue and with a special Angel’s Trumpet bookmark enclosed. (See photo of how it looks HERE.) If you purchase an autographed version for a gift and you’d like it personalized, be sure to include how you’d like it inscribed and if “from [your name]” should be included. One OR two books, $5.99. Three books and over: FREE PRIORITY SHIPPING AND HANDLING. S & H CANADA: First-Class Mail to one Canadian address: One book $7.99; two books, $15.00; three to five books, $20.00. Please contact us for shipping costs above 5 books. Wholesale and foreign orders are welcome; please contact us for details. Please “like” this book on Facebook! Thanks!